Robert Kegan, the author of The Evolving Self and In Over Our Heads, explores the vital role of interior development in creating a more inclusive and integrated world, as well as the importance of the appropriate use of discriminating awareness. Robert Kegan is a founding member of Integral Institute and the author of the critically acclaimed books The Evolving Self, In Over Our Heads, and How the Way We Talk Can Change the Way We Work. Bob is also the first-ever Meehan Professor of Adult Learning and Professional Development at the Harvard Graduate School of Education. As the holder of this endowed chair, Bob has the official support of HGSE to pursue developmental studies for the rest of his career. This is significant. For the past several decades developmental studies have fallen upon some hard times in academia. For many, to have a developmental view is to be hierarchical—and to be hierarchical is to be oppressive, regressive, patriarchal, and a direct contributor to the suffering of untold millions. The fact the HGSE has decided to so clearly support Bob’s work is a welcome sign that the winds may be shifting. It’s important to note that there are (at least) two significantly different ways that “hierarchy” can be understood: as it exists in the exterior structure of a society and as it exists in the interior structure of an individual. Historically, enormous abuses of power have occurred by those at the top of a societal hierarchy—but those who would do so are by definition not at the higher stages of the interior, developmental hierarchy. Psychologically, people grow through stages of increasing competence, care, and concern. Each stage transcends and includes the function of what came before, but excludes an exclusive identity with that function. First Order: Impulsive—Perceives and responds by emotion. Second Order: Imperial—Motivated solely by one’s desires. Third Order: Interpersonal—Defined by the group. Fourth Order: Institutional—Self directed, self authoring. Fifth Order: Interindividual—Interpenetration of self systems. Loosely, one can think of the first and second orders as egocentric (me), the third order as ethnocentric (us), and the fourth and fifth orders as worldcentric (all of us). If one grows from egocentric to ethnocentric, one doesn’t stop caring about oneself, but that care and concern is now extended to one’s family, community, nation, and so on. Likewise with the growth from ethnocentric to worldcentric, that care is now extended to all people regardless of race, class, creed, gender, etc. A person at the top of this interior hierarchy, i.e. worldcentric, would categorically never use any power given to them by a social hierarchy for less than worldcentric reasons. Needless to say, Hitler was not a worldcentric individual. As Bob points out, one of the most complete ways to illustrate how levels of developmental complexity exist in the subjective, intersubjective, objective, and interobjective aspects of reality is the diagram to the left. 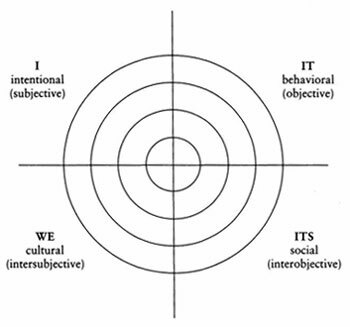 The Five Orders of Consciousness exist in the intentional (I) quadrant, but their influence permeates the behavioral (it), cultural (we), and social (its) quadrants. Likewise, those domains can influence the speed at which one does or does not evolve through the Five Orders. The higher the level of development, the greater the challenge of navigating the increasingly complex territory. For example, certain ways of navigating worldcentric consciousness are more effective than others, so in certain ways some forms of worldcentric consciousness are more mature than others. As Bob and Ken discuss, an important element of worldcentric consciousness is the contributions of postmodernism, including feminism, civil rights, and, among other things, the understanding that a substantial amount of human knowledge is context dependant and culturally bound. But postmodernism then stepped beyond what it had evidence for and claimed that all knowledge was relative, and therefore nothing could be said to be better than anything else. In fact, a fellow researcher, Clare Graves, called this level of development relativistic (Spiral Dynamics green), which research has shown accounts for about 20% of the American population. But as Ken points out, that means that about 20% of the population has gotten confused about how to make conscious, explicit judgments. Most of the people in this group would agree that a worldcentric embrace of all cultures is better than ethnocentric racism, but postmodern relativism won’t be able tell them why it’s okay to think this way. When all judgments have been outlawed, even sensible examples of discriminating awareness rightly applied have nothing to stand on. A more mature, integral form of worldcentric consciousness acknowledges that there are different levels of consciousness existing in the world today, and that encouraging growth towards greater care, concern, and wholeness is entirely appropriate. No one is required to change the way they are living, but everyone is invited to discover for themselves these higher territories of human potential. For anyone interested in exploring the possibility of further growth and transformation, it never hurts to have a good map of the terrain ahead. We hope you enjoy this dialogue between two of the best mapmakers out there for the ways we can all inhabit the deeper levels of consciousness this world so desperately needs….